The Orioles’ 2008 top pick showed promise in his major league debut on Tuesday night. However, one of the Orioles’ first-round picks from more than a decade earlier serves as a model that there are no guarantees in baseball. The Louisville Courier-Journal caught up with Darnell McDonald, now 30, who currently roams the outfield for the Triple-A Louisville Bats. Excerpts from the article follow the jump. His career hasn’t turned out the way he expected. He was a first-round draft choice of the Baltimore Orioles in 1997, but he has spent most of his time in the minors. He caught a major break in April when he made the Cincinnati Reds out of spring training. He started in center field on Opening Day. But the euphoria was short-lived. 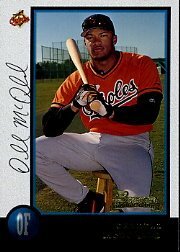 McDonald, 30, was demoted in late May to the Louisville Bats after hitting .175. He could have sulked. He could have quit after playing for six organizations. Instead McDonald hits. He leads Louisville in batting average (.317) with seven home runs and 33 RBIs in 57 games. McDonald cites his immaturity and instability in the Orioles front office as reasons his career didn’t blossom. He also had some life-altering experiences as a youngster.